A pretty great movie about a singer’s rise to success and the relationship she forms in the process. 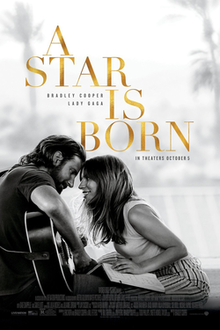 It might not look like anything spectacular, but the newest remake of A Star Is Born is actually a very good film. With Bradley Cooper making his director debut, he really nails this one from the casting to the performances to the dramatic beats to the terrific music. Sure there are occasionally some slow moments, (if anything, they can be found in the first half,) but that does’t divert us away from the storyline of this young up and comer, and the man who gives her the spotlight at one of his shows, and ends up falling in love. Pretty much everything about this movie works. There’s even some great humor here, (what do you expect when you cast Dice and Dave Chapelle in supporting roles.) And yet the movie never loses sight of its story of one character rising while the other one is falling. And despite all that, there’s never really any jealousy like you might expect. Instead, these characters support each other and want the other to succeed. It works. The drama is there in the second half, and it works to give this movie the final beats of tension and energy that it needs. A Star is Born, the Bradley Cooper version, is s wonderful movie. This is the second remake of an original film (so the third version,) and supposedly it’s the best. That’s not very surprising, considering how good this film is. It captures great music, good humor, and a pretty dramatic story. And it does so at the hands of first-time director Bradley Cooper, a man who has been really proving himsel as a motivated and committed actor for about a decade now. Just watch Cooper in some of those behind the scenes videos from Guardians of the Galaxy, as he does every movement of Rocket Racoon’s, while giving voice to the CGI character. It’s not motion capture, but you would think it was from the way Cooper is rolling around in the part. Watch him in Silver Linings Playbook, giving his full dedication to playing a character who is both funny and charming, and also completely unstable. Cooper is the man. He’s the reason why the Hangover movie (the first one,) works so well. Without him, there’s no cool guy or voice of reason to make you care. 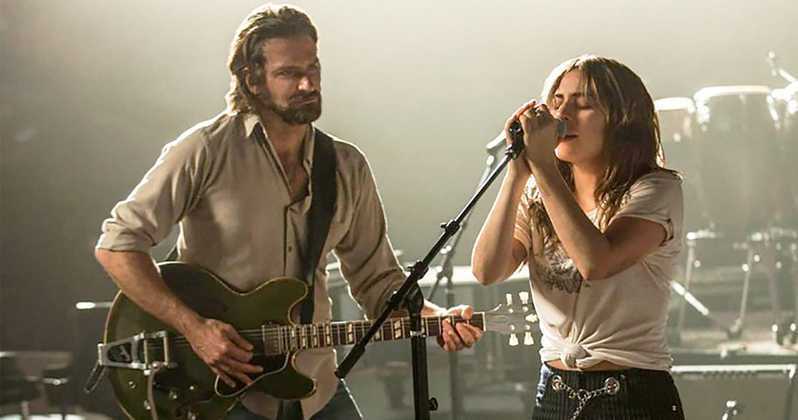 Well, with A Star Is Born, Cooper is going for an epic performance, not just for him, but also for Lady Gaga as his costar. The movie is about the rise of one singer and the fall of another. Only these two aren’t in competition. In fact just the opposite. They start out as mentor and mentee and end up as husband and wife. And it’s a pretty fascinating story that binds them together. Cooper plays Jackson Maine, a lively rock star with a drinking problem. He delivers the goods on stage, and we get up close and personal with him during the first performance of the movie, as he belts out some fun musical numbers in front of a packed crowd. And then he comes down and spends the night being chauffeured around the city by his driver. When the bottle that the driver has in the car for him runs out, Maine makes the driver stop off at a bar for him to go in and have a drink. As it happens, this is a drag bar, and only one of the performers who gets on stage and looks like a woman is indeed, actually a woman. This is Ally, played by Lady Gaga. She gets up and performs and Maine is instantly taken with her. Maybe it’s because she’s the only woman there, but what’s more likely is that she is really mesmerizing and talented, so much so that she’s the only woman the drag queens will allow to perform in their show without actually being a drag queen herself. And Maine recognizes both her beauty and her skill. He goes backstage to meet her and they discuss Ally’s fake eyebrows. It’s a small detail, but when Maine cherishes the opportunity to help peel them off, it becomes kind of fun. Cooper plays this character so well. He’s a sweetheart who is infatuated by the simple things. And Cooper uses a grungy, rough and tumble, Jeff Bridges / Sam Elliott – like voice. Elliott plays his brother in the movie, and apparently that’s the reason why Cooper uses the voice (to make him sound more like his brother,) but boy does it work. It makes the character feel like he belongs in the world of country music, been around the block experience, and way too many cigarettes. Maine ends up spending the night with Ally, going grocery shopping (for ice for her hand, after she punches a guy in the face,) and sitting on a stoop in a parking lot, listening to her sing. The next day, he has to fly to another state to do a show, but he sends a private car and then a private plane to come and get her and bring her to watch. Ally’s best friend and coworker comes along, and the two of them fly to Maine’s concert and are rushed backstage. And that’s when Maine brings Ally onstage to sing her song. Only she doesn’t want to do it at first, and so he starts singing her song for her, to prompt her into coming up. She does. And she delivers. The song is fantastic, and watching Ally slowly become comfortable singing it is pretty cool. The music in this movie is terrific, all around. And the movie does something pretty smart to get us into it. You see, they know that the more times you hear a song, (so long as it is a good song,) the better. What that means is that if you hear the song once, it’s just okay, but hearing it a second time, you already know it, and so it sounds familiar. That makes you enjoy it a little more. It’s why people go to concerts and want to hear bands play their hits. They like it when they recognize the song. Same thing here. And so this movie has characters sing the songs once before getting on stage, and then a second time while on stage. There are two such situations like this. The first is when Maine gets up at the drag bar and sings a song to just two or three drag queens there. We later see him sing that same song to a crowded arena during one of his concerts. And the second example is Ally’s song. We hear it first in the parking lot, and then a second time on the stage with Maine getting Ally to come up and sing it for herself. The video of her singing goes viral. Ally’s father back at home (played wonderfully by Andrew Dice Clay,) and all of his friends are watching it on their phones, celebrating. And pretty soon, Ally is the next big thing. Only she doesn’t turn her back on Maine like you might expect. This isn’t one of those movies where the young and talented next big thing replaces the old. Instead, they stick together and get married. In fact, throughout the movie, we only see them have one fight, and it’s quickly resolved. This is a movie that defies the cliches and flies in the face of usual expectations. But like any good movie, there has to be conflict, and that comes in the form of Maine’s drinking and drugs. It really comes out during the Grammy Awards ceremony, where Maine unintentionally makes a scene by not being able to hold himself up, while his wife is accepting her award for best new artist. And from there, things continue to spiral out of control. The movie definitely has it’s drama packed in, although pretty much all of it comes out in the second half. Even still, what’s beautiful is how little of it can be predicted. We expect Maine to get jealous of all the publicity and success that Ally is having, only (save for that one small fight scene,) he never does. He’s happy for her. A movie as smart at this one is pretty special. 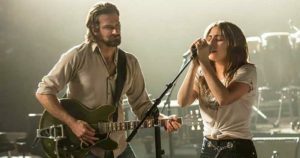 And everyone, from Cooper to Gaga to Sam Elliott to Andrew Dice Clay, is knocking it out of the park, in terms of how performances go. What a good movie.